Hi and welcome to “Stressfully Speaking,” a regular blog column on the topic of stress, stress management, balance and achieving inner peace in these turbulent times we are living in. There is no doubt we are living in stressful times, and despite the fact that every generation says that theirs was an age filled with stress and turmoil, never before have so many changes come our way so rapidly as this time we are living (and this was BEFORE the economic meltdown). This blog will offer some ageless wisdom, timeless insights, inspirations and personal reflections as we navigate these troubled times together. Please take to heart what you like and disregard the rest. My hope is that this content inspires you and helps you achieve a sense of peace to mind, body and spirit. In doing so, helps you to enhance your optimal wellbeing. Stress, it has been said is the equal opportunity destroyer, but it doesn’t have to be that way. By taking the time to be fully conscious about our thoughts, perceptions and actions we can rise to our highest potential, and this after all, is what life is all about. Take a News Fast by limiting your television (and perhaps all media) news to 10 minutes a day, preferably in the afternoon so as not to start your day on a bad note. Most news today is fear-based, following the well-known news motto, “If it bleeds, it leads.” Negative news adds to the critical mass of negative stimuli we encounter in our personal world and can push us into a spiral of negative thinking without even knowing it. If there is something really important to know about, trust that someone will tell you. Last week, a dear friend sent me a link to a new movie trailer, a documentary on the coming shift in consciousness (see below). There has been a strong current of consciousness swelling over the past decade or so regarding the delicate balance of human nature and mother nature, war and peace, cultural, humanitarian and environmental responsibility and many, many other issues. As a member of the Institute of Noetic Sciences (IONS) for the past 16 years, these are the issues we discuss at annual conferences, journal articles and small group meetings. The basic premise is that we need to shift (and raise) the focus of consciousness if we are going to survive as a species on this planet. The preview of this movie gives a taste of this shift and I highly recommend that when the movie comes to a theater near you, you bring a few friends to see it and then take some time to discuss the concepts among friends to help raise consciousness for all. One person can make a difference and many people can change the world! 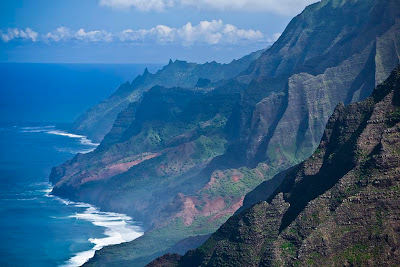 The photo at the top of this page was taken (by me) at the end of the Nualolo Trail on the Na Pali Coast of Kauai, Hawai. Friends, It’s All About Friends! Real Friends!